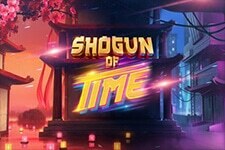 "It's all about romance in the 2017 Microgaming title. 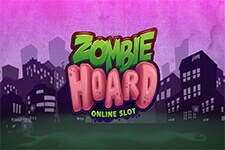 If you are in mood for love, give it a try and you can win up to 1,800,000 coins to pamper your chosen one." February is the month of love and software developers typically launch love-themed slot machines during it. In February 2017, Microgaming released the Secret Romance video slot loaded with luxury items and promising a whopping 1,800,000 coin jackpot. You don't have to be in love or have a secret love affair to play it, as its classy graphics with predominant golden and red will provide you with an enjoyable gaming experience. We don't say that you will be knocked off your feet by the quality of the slot's design, but it is quite decent to nicely deliver the theme of the game. When it comes to audio, generic sound effects are included, so the overall aesthetics of the game is not that impressive. The game uses 5 reels and 15 fixed paying lines which you should cover with at least 3 symbols of a kind in succession left to right to win a prize. Up to 20 coins can be wagered per line and the coin denomination ranges between $0.01 and $0.05. Choose your bet between $0.15 and $15 and you are good to go. High-value symbols include masks, brooches, heart-shaped wreaths of roses, perfume bottles and red roses. Other positions are occupied with golden playing card symbols decorated with diamonds, which adds to the overall luxurious feel of the game. 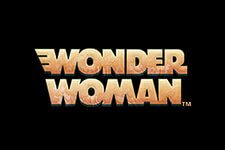 Wild is represented as the ruby heart with the logo of the game and it substitutes for all the symbols apart from Scatter. The diamond ring stands for Scatter and three or more symbols of a kind appearing anywhere in view unlock the free spins feature. The feature awards 14 free games which can be highly lucrative due to super stacked Mystery symbols we will explain further below. Scatters pay in their own right, so you can win up to 1,200x your total bet of you fill the grid with diamond rings entirely. In addition, whenever 3 or more Scatters appear on the reels during the free spins feature, they will increase the multiplier trail awarding up to 5x multipliers. As for Mystery symbols, they are active throughout the game. During the base game, they can appear in stacks to cover the reels completely and reveal any symbol except Wild. When appearing during free games, Mystery symbols can transform into Wilds, too. 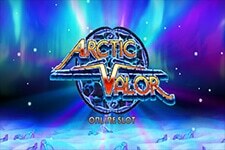 Given the fact that Wild is the top paying symbol awarding 350 coins for a 5 of a kind combination, the free spins feature can provide you with loads of excitement and pretty high payouts. 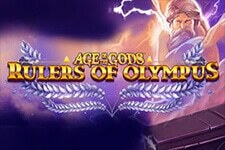 Plus, your payouts can be multiplied by up to 5x. 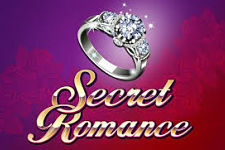 Find Secret Romance at any of Microgaming casinos. 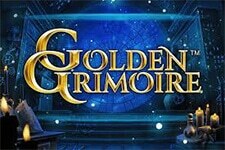 Hit the Spin button to start your Secret Romance. 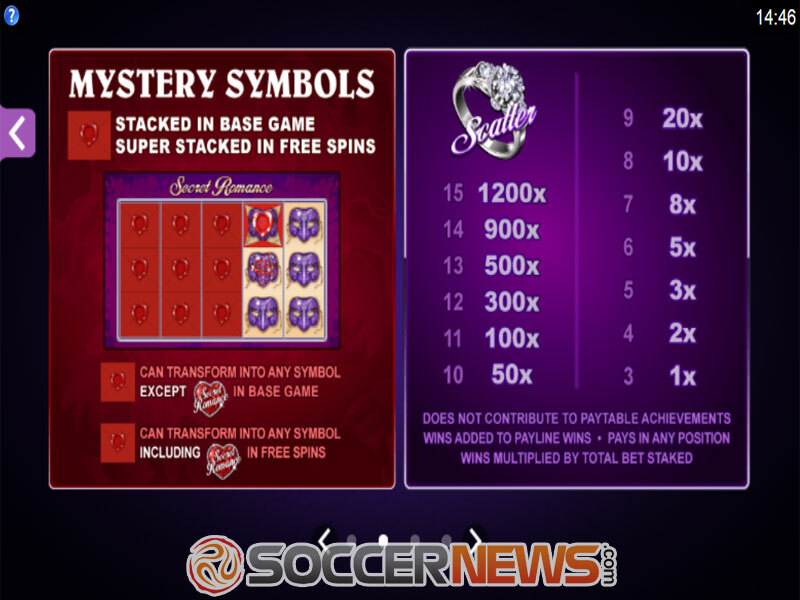 Watch Mystery symbols stack up on the reels and complete multiple winning combinations. 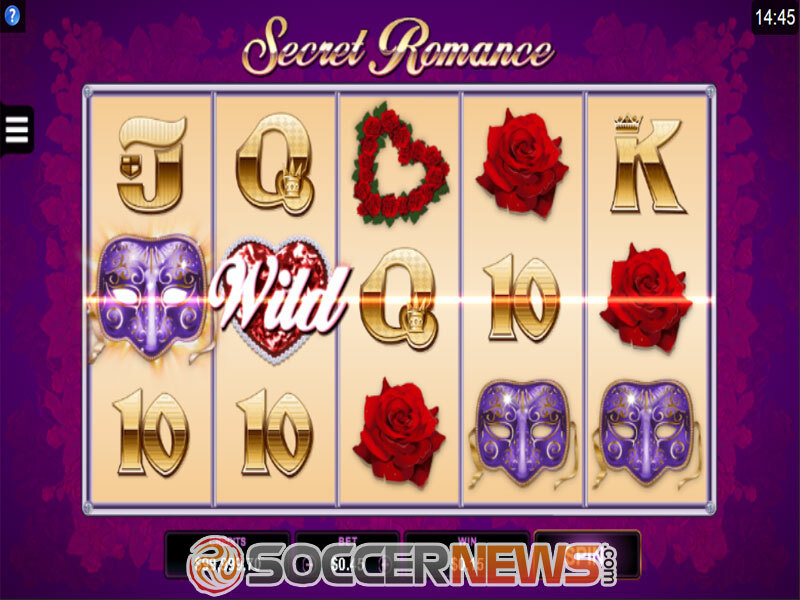 "Secret Romance may not be the most attractive video slot when it comes to its graphics and sounds, but the top prize standing at 1,800,000 coins is quite alluring. Look out for Mystery symbols as they complete multiple winning combinations, especially during free games which promise hefty payouts. You don't have to wait for Valentine's Day to come, start your Secret Romance now."